Wags is joined by the host of the DFS Army Dispatch, Keith Hall. Keith shares his experience of competing in the 2015 WFBBC and what its like to have a $50,000 lineup. The guys talk trades and rumors in the NBA and tonight’s MLB DFS slate for DraftKings. TWW has been picked up by 104.9 FM The Horn. We are excited to grow our relationship with The Horn and enjoyed the work we’ve done there so far. Tune in to get the scoop on everything you need to know about Austin, Texas. Use Promo code WAGS for 20% off! Click that mean looking mug above to find out how you can get started on your way to winning $100 a day. Use my promo code within the first 7 days to save 20% on your VIP subscription. Its a game changer! Enlist in the DFS Army today at dfsamy.com. FantasyPros.com is a pretty cool fantasy sports site that we use to help formulate our fantasy football mock drafts. Their Draft Wizard tool is unique and one of the best tools in the industry. Click on the banner or pic to explore a new experience when you prepare for your draft. Draft like the pros. Go to FantasyPros.com. 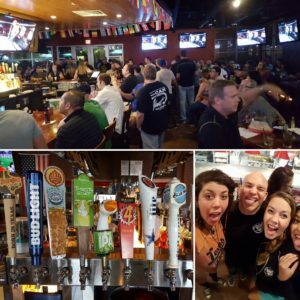 If you haven’t checked out Third Base Sports Bar, you’re doing yourself a disservice. By far the best setup in Austin to watch sporting events. 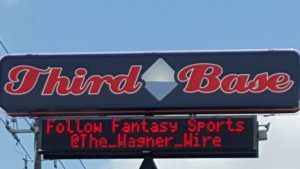 Follow Third Base and The Wagner Wire on Twitter, Facebook, Instagram, etc. Come in show the crew that do, and you’ll get $5 off your bill of $20 or more. Live shows are also in discussion. Follow to stay informed. 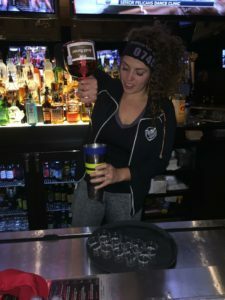 Get a little crazy with the Third Base Crew! ITS A GRAND OLE TIME!